Napkin Holders Set is a set of 6 napkin holders in sterling silver designed specifically for the Exhibition Fit for Purpose and bears the unique hallmarks for the Queen’s Diamond Jubilee year. 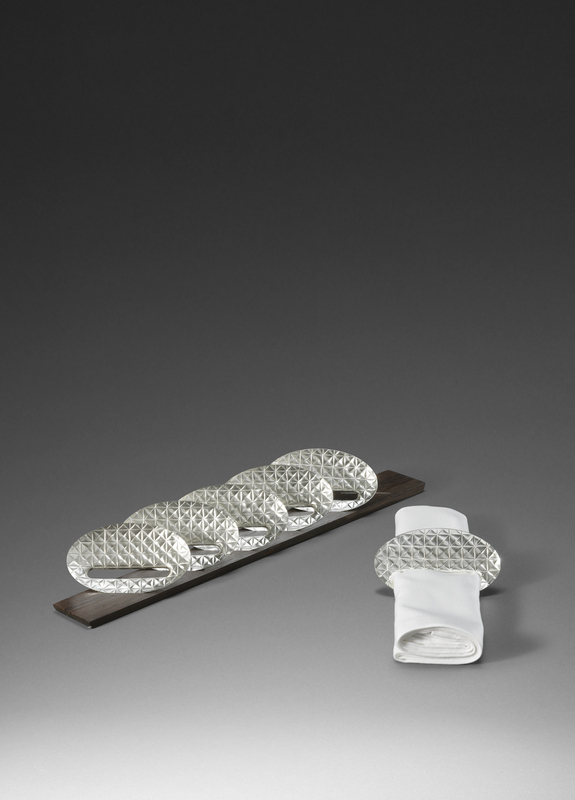 De Quin exhibited the object as part of a group show of contemporary work in silver by members of Contemporary British Silversmiths. De Quin’s piece along with 51 other pieces being shown represents her response to the exhibition title Fit for Purpose. The exhibition is displayed within the V&A’s Silver Galleries (http://www.vam.ac.uk/content/articles/f/fit-for-purpose/) and was timed to coincide with the V&A’s major exhibition British Design 1948 to 2012: Innovation in The Modern Age. Fit For Purpose designed to function as a complimentary satellite display. The object captures the artist’s interest in exploring the traditional technique of chasing within the context of a design that considers the demands of functional tableware for contemporary dining. De Quin first used this technique in a one off work titled Tall and Small in which decorative elements in non-precious metal are used as a passive device to consider the scale and proportion and orientation of 2 precious metal vessels. The elements take the form of single curved walls in contrast to the more complex form of the 2 containers. Napkin Holder Set uses chasing as both decorative and functional form. Containment offers opening which requires the fit of a folded napkin to complete it within a table setting. Napkin Holder Set is given added dimension through the use of a hardwood stand which considers the practice of storage and offers additional opportunity for display when the pieces are not in use. This research extends the formal experiments of Enclosure bringing contemporary innovation to the more traditional silverware design of the V& A displays and collection.